Size does matter... Whether being carried from location to location or being used at a fixed site, the Earscan® 3 Manual Audiometer is a perfect fit. This lightweight, truly portable audiometer is equally at home in the palm of your hand or taking up a fraction of the work space of other “portable” audiometers. So does quality... The Earscan® 3 Manual Audiometer has been designed to the same strict quality standards that have defined all Micro Audiometrics products, from the durablity of the enclosure to the signal presentation quality. With one of the longest warranties on the market, you can be sure the Earscan® 3 will serve you now and in the years to come. And so do features... 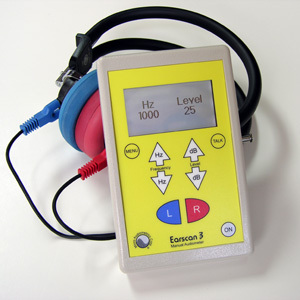 The Earscan® 3 Manual Audiometer allows you to select test frequencies and levels to meet your requirements. Your specific settings are saved and can be changed at any time. Operator to patient communication (talkover) is built in, allowing test instructions to be presented via the headset. Calibration mode is password protected to ensure the integrity of data, and a calibration due date reminder is displayed at startup.